Hugh Howey's Wool was my favorite book last year. Fortunately, I also read Shift and Dust to finish the trilogy, both exercises in lowering my expectations. I'd say that Sand was almost on par with Shift and Dust. The world he's built in Sand is compelling. I can sometimes imagine myself there, diving in the sand, experiencing it like snow or water, thanks to his writing. "Don't do this, [character name]. You don't have to do this..."
But like a sucker, I'll be there, throwing my money at Hugh Howey's next novel, I'm sure of it. Hoping to recapture some of the magic in Wool. 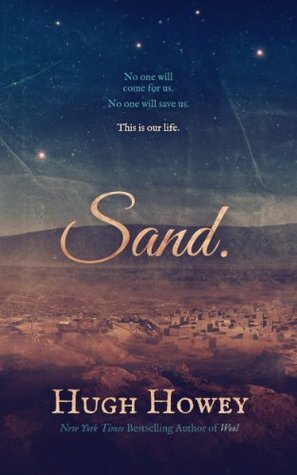 Sign into Goodreads to see if any of your friends have read Sand Omnibus. I'm just on Shift, I'd stopped reading it for while because it was so unlike Wool, then I got into it. Interesting to have an idea what to expect...if I keep on going. Thx. Mary wrote: "I'm just on Shift, I'd stopped reading it for while because it was so unlike Wool, then I got into it. Interesting to have an idea what to expect...if I keep on going. Thx." Penley loved all 3 in the Wool trilogy. Another friend thought they were "good." I'm the only person I know who had such a letdown after Wool. So this might all be me. Louis tried reading Wool but it was too much for him. I actually think he might enjoy Sand more. Yes, it's fascinating to see the progression.